This might sound strange, but I love an empty refrigerator. Don’t get me wrong, I love a full fridge, too. But there’s something about an empty refrigerator. I think it has to do with possibilities. I tend to buy in cycles, filling it up with loads of groceries, then watching them dwindle away. I once had a friend who would periodically donate a large percentage of her clothing. She thought an empty closet was easier to work with, and found that having fewer options led to more creative pairing. You could say the same thing about the refrigerator. And when the task is accomplished, when everything has been used up, and you’re left with only basics, it’s liberating to start all over again. That's about where I was when I concocted this pizza. Frozen dough in the freezer, caramelized onions in the fridge, and not much else. And what came out of it all was, if I have to admit it, brilliant. I'm in love with these onions anyway, no matter what they're used for. Here, they infuse a pissaladière with new personality. Traditionally, pissaladière is a French pizza of caramelized onions, olives and anchovies. A perfect medley of Mediterranean flavors. But in this preparation, since my onions were already flavored with a combination of deep Indian spices, olives and anchovies just would not have been the thing(s). So instead, I coated the dough with a thin film of crème fraîche before spreading my spiced onions over the top. On request or demand, I added some poached chicken and the whole thing was done. And R and I were both sent directly over the moon. Fill a sauce pan with water deep enough to cover the chicken breast. Bring the water to a boil, then add the chicken breast, cover and reduce the heat to low. Cook for 15-20 minutes (or as little as 10 minutes if you're using a boneless chicken breast) until the chicken is cooked through. Allow to cool a bit, then cut into bite sized pieces. Preheat the oven to 450F. If you're particularly well equipped (which I am not) preheat a baking stone in the oven. Roll out your pizza dough to desired thickness. Spread with a thin coating of crème fraîche and top with the caramelized onions. Finish with a layer of chicken pieces. On a baking sheet, pizza sheet or baking stone, bake your pizza for about 10-15 minutes, until dough is browned. * For a vegetarian version, obviously just leave off the chicken. I got talked into chicken by R, but the pizza would have been just as good without it. * This would be a good recipe to use up leftover poached (or otherwise cooked) chicken, so keep it in mind next time you prepare some breasts, and cook an extra one. * If you can't find crème fraîche, you can just use a little sour cream, or you can make your own. I love the chicken idea on it. You're so creative. And I love your opinions on empty refrigerator. It makes us think more, which means create more. Your creations are the best. I could eat pizza everyday, so I'm on board with this one! 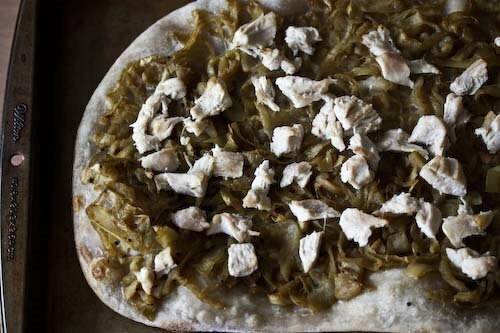 Most of the time when my fridge is near empty I throw a bit of everything into pasta or fried rice, but I should try that pizza combination (but without the chicken) sometime - sounds great! 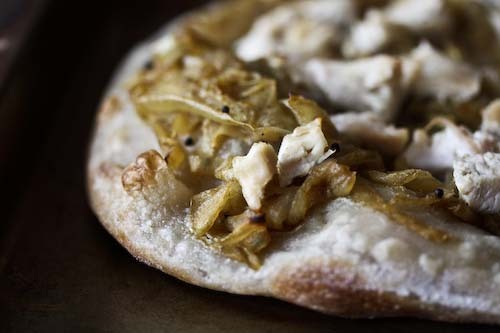 Great combo--I always love carmelized-onion pizza, but the Indian spices...yum. There's frozen naan in my TJ's, bet this would be good on, or next to, it!